Ultra-Energy Efficient Homes: Are They Worth the Upfront Cost? When building a new home, design and material selection greatly impact the operating costs for decades. Investing in triple-pane windows and doors, generous insulation, and air sealing can greatly reduce your heating and cooling costs, while also boosting comfort. Is it financially savvy to construct a super efficient home over a code-built home because of the reduction in operating costs? The simple answer is yes, but the more detailed answer is that it depends. Some energy efficient upgrades have a lot of bang for your buck, while others don’t. Your local climate is another variable. Tessa Smith, co-owner of the Artisan Group in Olympia, Washington says the payback period of upgrading a home to an ultra-energy-efficient home over a code-built house can be a mere five years or less in the Pacific Northwest, with the upfront construction costs being four to six percent higher. Super-efficient homes require an investment in different materials and mechanical systems, some increasing and others decreasing the construction costs. Mechanical ventilation, more efficient hot water heating, upgraded windows and doors, and more insulation add to the cost, while money is saved on the heating and cooling system, according to Smith. Super efficient homes with air sealing require mechanical ventilation to circulate outside air, bringing in a fresh stream of filtered air and preventing mold issues. Such homes typically don’t use combustion fuels, such as natural gas furnaces and propane stoves, because the byproducts contaminate the indoor air quality. Airtight homes with air sealing allow very little air into the home, thus fresh air is brought in with a ventilation system that recycles heat. 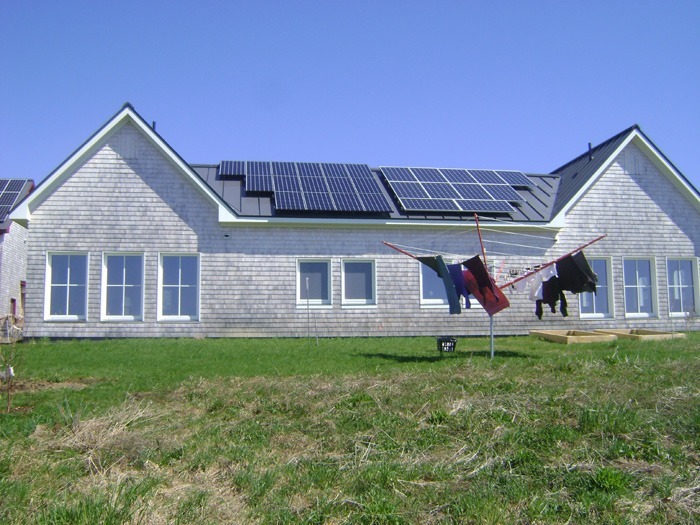 All 36 homes at Belfast Cohousing & Ecovillage (BCE) in Midcoast Maine have Zehnder heat recovery ventilation (HRV) systems, that transfer 90 percent of the heat from the exhaust air to the intake air before it exits the home. Stale air is removed from the kitchen and bathrooms and fresh air is supplied to the bedrooms. Although a high-efficiency HRV system for a house may cost more than exhaust-only ventilation, it is a necessary fixture in high efficiency homes and reduces the operating costs by allowing a higher level of energy efficiency that would otherwise result in poor indoor air quality and moisture issues without mechanical ventilation. A typical code-built house exchanges air into and out of the home through leaks, exhaust fans and mechanical systems, although this is very inefficient when it is cold outside because the heat isn’t captured before leaving the home. The HRV system helps make it possible to remove a much costlier and less efficient furnace or boiler by very efficiently heating intake air with recycled heat from the exhaust air. Gibson estimates that replacing the heating system with electric baseboard heaters saves $15,000 in the 1,500-square-foot homes. Other energy-efficiency components boost the construction costs, including air sealing, a high-efficiency heat recovery ventilation system, improved insulation, and triple-pane windows and doors. The result is a 7 percent increase in construction costs, with a seven and a half year payback period from the energy savings. These energy efficiency upgrades result in a 90 percent reduction in energy for space heating compared to the average house, yielding much lower heating bills. Gibson estimates a 1,500-square-foot BCE home uses $300 to heat using electric baseboard heat, while a standard Maine home costs over $2,500 to heat with an estimated 680 gallons of oil. In addition, the homes stay cool in the summer without needing air conditioning. If these ultra-efficient homes are purchased using a mortgage, it results in lower annual bills (a higher mortgage offset by lower electric bill), thus having an instant payback.